From its founding to today, Student Transportation of America prides itself on being a family business committed to the safety and the well-being of the students who depend on us each day. A third generation entrepreneur, STA’s Founder, Chairman and CEO Denis J. Gallagher wanted to draw on his family’s roots in the transportation industry to start a new company with a safety-driven, family-oriented business plan. 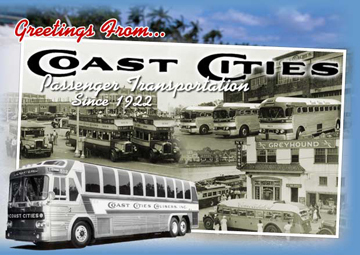 The original family business, Coast Cities, is formed by Denis’ grandfather and father. After spending over 25 years in the school bus and transportation industries, Denis formed Student Transportation Inc. based on the principles he learned from seeing Coast Cities succeed. Taking care of your employees, customers and the communities where you operate translates into success - both for the customer and for the company. The company is listed on the Toronto Stock Exchange and becomes available for trade under the ticker symbol "STB", operating 3,300 vehicles in 10 states. STI forms and establishes Student Transportation of Canada (STC). The company is listed on the NASDAQ Stock Exchange, also available for trade under the ticker symbol "STB." Patrick Vaughan is appointed as Chief Operating Officer. STI earns its largest bid win in history, contracting with Omaha and Millard Public Schools in Omaha, Nebraska. STI purchases and proceeds to operate the largest all propane-fueled school bus fleet in the industry. STI earns its largest district conversion in history, contracting with Meridian Public Schools in Meridian, Idaho, operating with the local family name of Cascade Student Transportation. STI hires Thomas Kominsky as Chief Growth Officer to drive its newly developed Managed Services Group of business offerings. STI secures record breaking 10-year, $187 Milion contract with customer in Jacksonville, Florida, doubling the Company's operations in the location and becoming the largest contract in the Company's history. STI celebrated its 20th anniversary on May 17, 2017, and was invited to the closing bell ceremony at Nasdaq in New York City. More than two decades later, STA has grown to operate across all of North America while remaining dedicated to safety and nurturing a unique company culture that focuses on three groups of critical stakeholders – employees, customers, and communities. Our commitment to our employees begins by treating them well and training them often. Beyond that, we strive to know them on a personal level and to be there for them in challenging times. We aim to foster a culture of helping each other. This helps us create a sense of family, pride and empowerment, with employees that are happy to get children to school safely and on-time. Our commitment to our customers is to provide safe, reliable and cost-effective student transportation. We work with our districts to find a customized transportation solution that is right for them, and we treat them as valued members of our family. Our success in being responsive to their needs is best demonstrated through our 95% renewal rate, consistent customer satisfaction and our proven track record of providing the safest service in the industry. Our commitment to our communities is three-fold. First, our management values the tradition of service established by its family of local companies. While other contractors concentrate on maximizing their strength in numbers, STA has grown by understanding that school transportation is a “local business.” Second, we are committed to environmentally conscious programs across North America, reducing emissions, and promoting better health and safer environments for our passengers and their families. And last but certainly not least, our family of companies strives to make an impact through various community-giving efforts and service to others including fundraisers, volunteer initiatives and more. By investing in all of the above, we demonstrate our commitment to building a company where customers, communities and shareholders can invest in us. This safety-driven family culture is rare today, but it is what makes Student Transportation of America the partner of choice in the school transportation industry.